International. 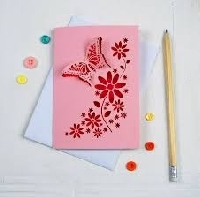 Summer is here butterflies are out so let's send a nice notecard featuring butterflies. Cards must be bi-fold. No postcards. Storebought or handmade. If handmade you can make it with any artistic medium you choose. You will have 1 partner. Please send something you would like to receive. Please write a note to your partner introducing yourself. There is also a US only version of this swap.